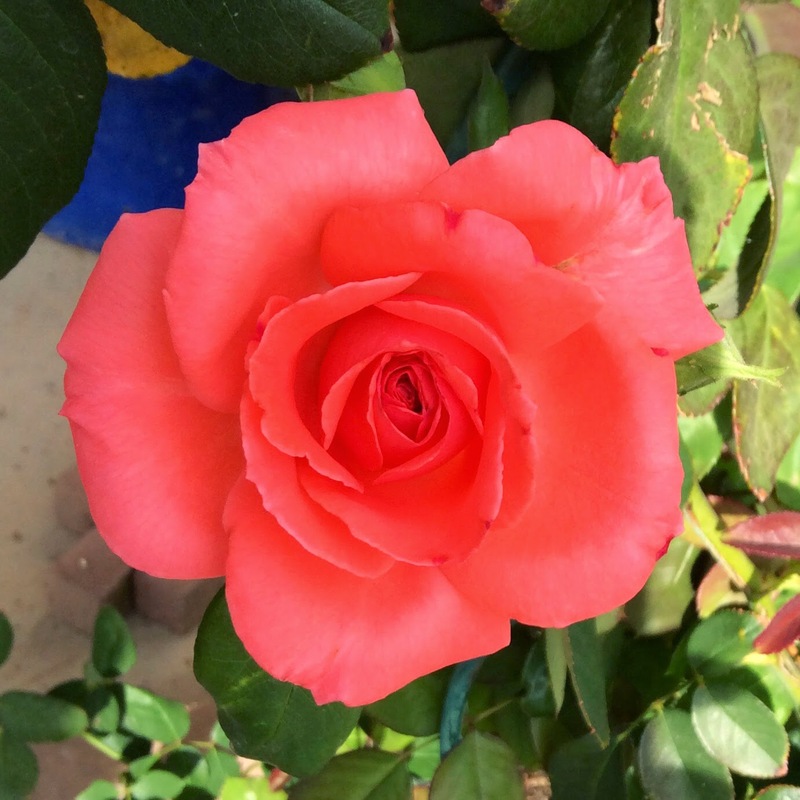 Right now this rose bush is putting on quite a show! This beauty is called Orange Jubilee . . . It provides shade for our patio in the afternoon and pollen and nectar for hummingbirds and bees! 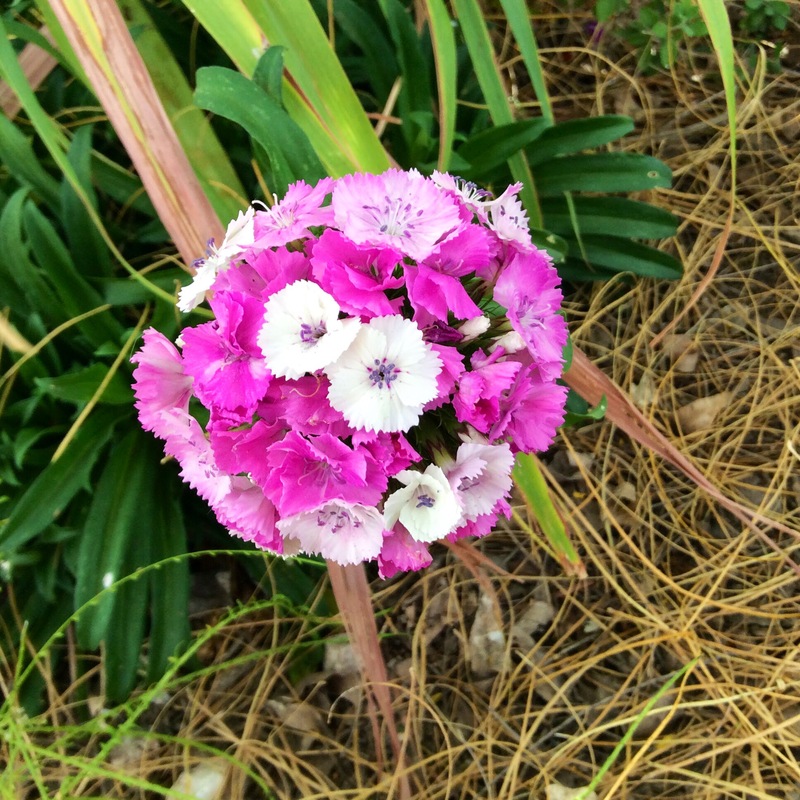 This pretty multi covered bloom is called Sweet William. 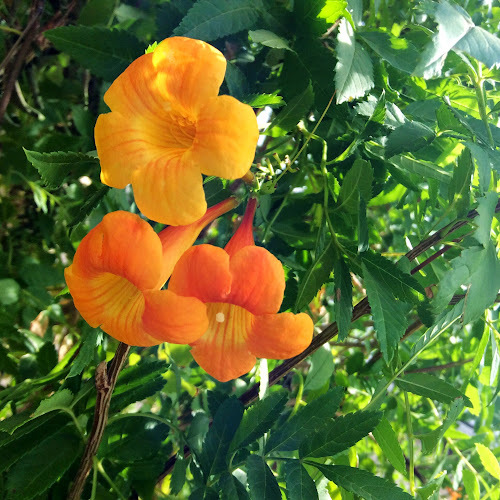 I sowed the seeds in the garden a year and a half ago, and these are its first blossoms! They smell very much like a spicy carnation and stock plant mixed. 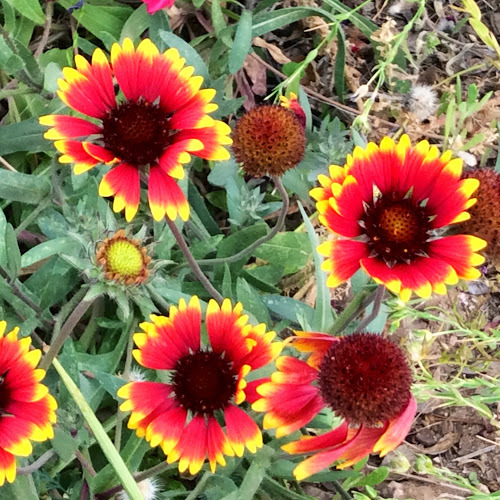 These pink flowers, above, and the red and yellow flowers, below are from the Gaillardia family ~ Common name Blanket Flowers! They remind me of the vibrant colors woven into our Native American Indian's beautiful hand woven blankets! This plant is a Lantana . . . I hear they grow wild all over southern Australia and can become quite a nuisance! 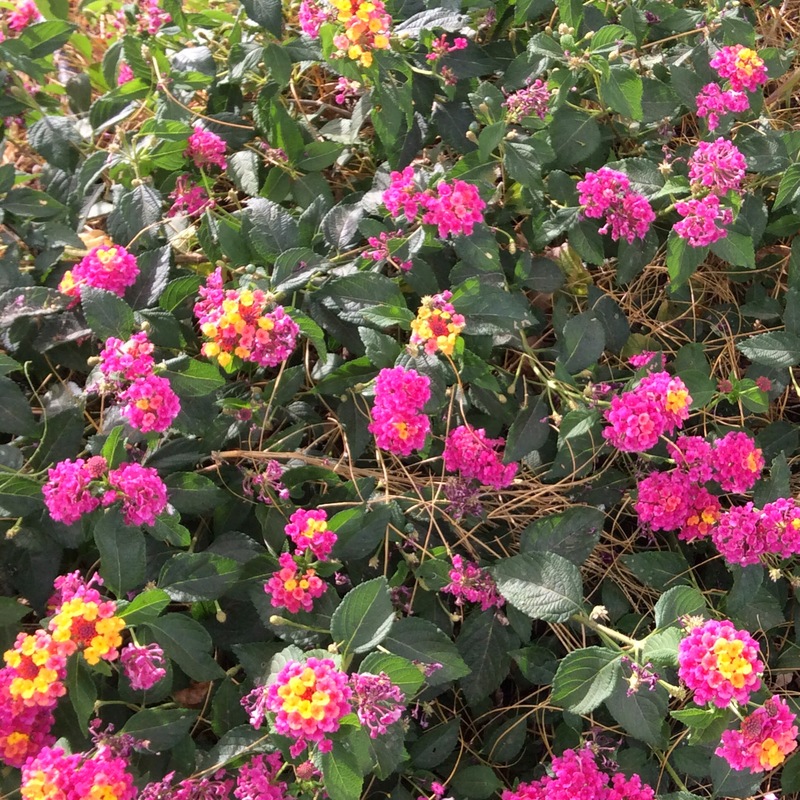 Tiny butterflies love this plant! 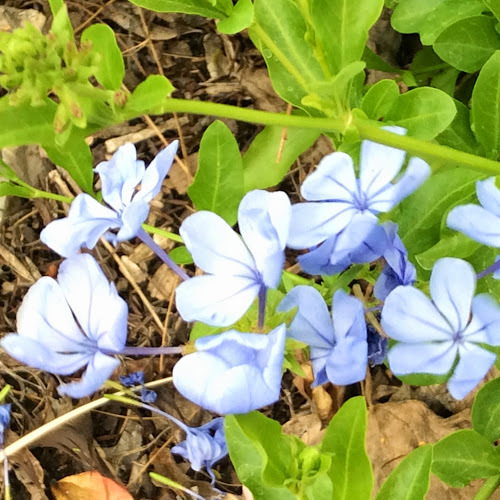 This is a Blue Plumbago (what a name!) . . . 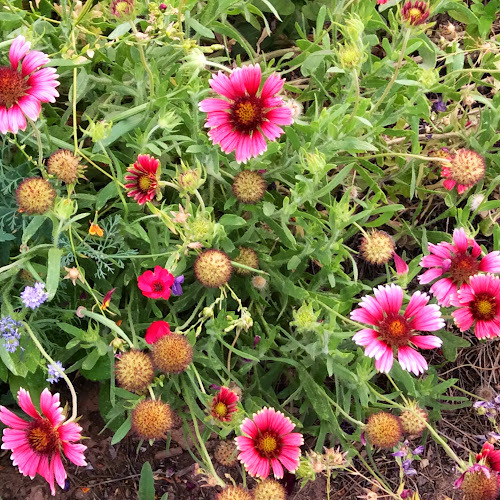 I thought our Little Pollinators would be crazy about it but they really don't care for it! This plant is very frost tender but comes back every spring. 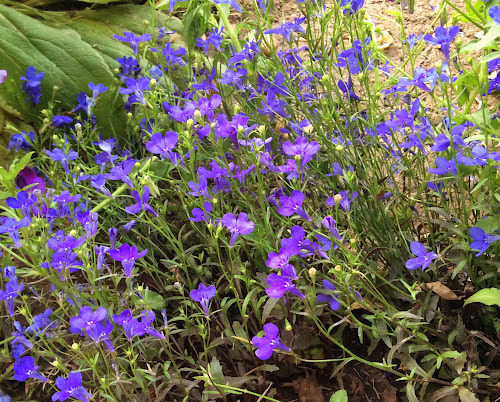 It produces a profusion of blue flowers Spring, Summer, Fall and Winter, up until the first frost. This bright, electric blue plant is called Crystal Palace Lobelia. It dies out during the heat of summer, but re-seeds and comes back each Spring. 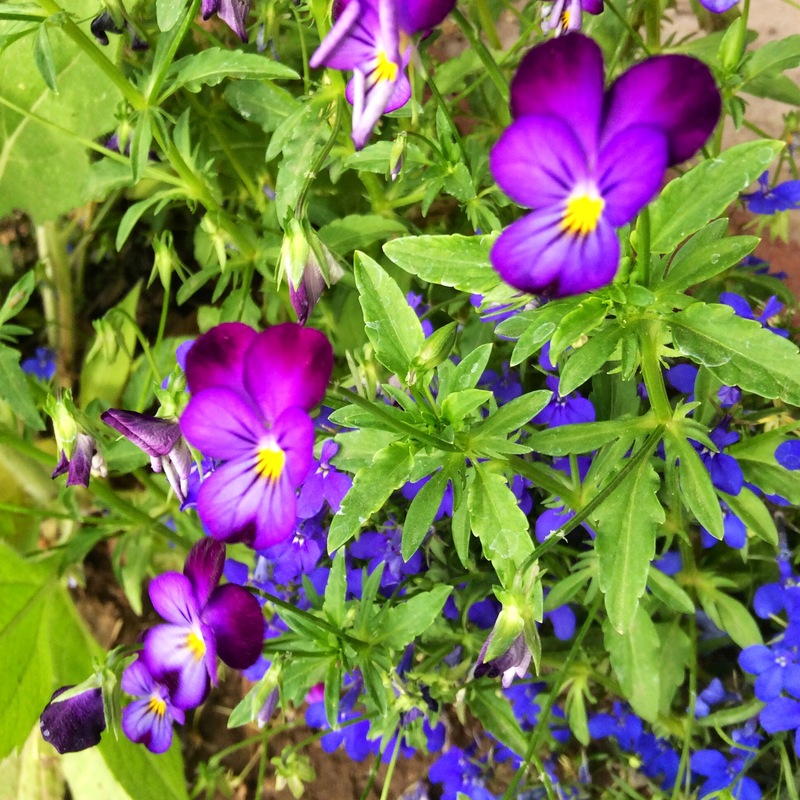 These cuties are called Violas or Johnny Jump Ups . . . Part of the Wild Violet family . . . They are edible and make a pretty addition as cake or cupcake toppers or an edible garnish in tossed salads! This is my 15' x 15' Wonderful pomegranate tree. 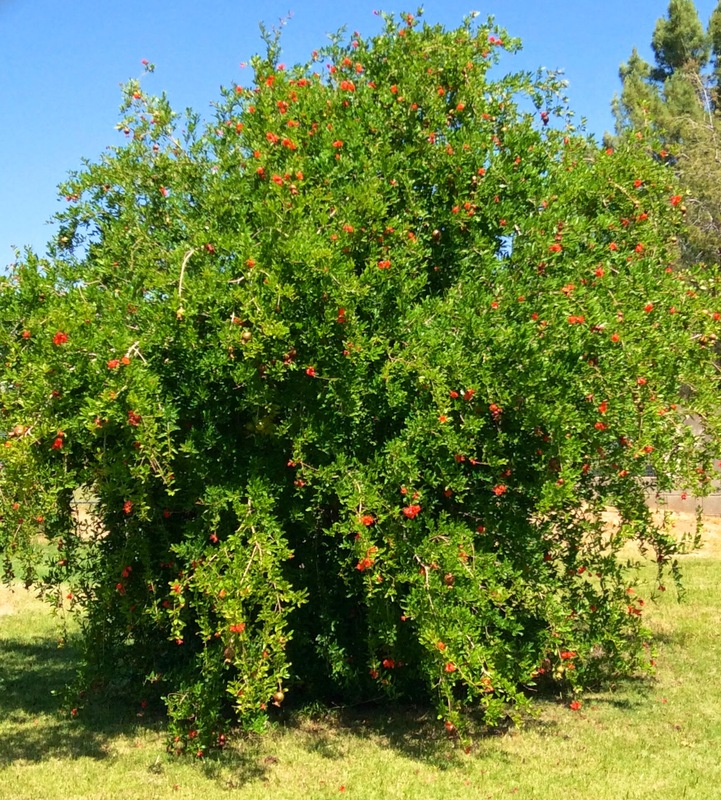 It started out a as scraggly 10-inch plant in a 1-gallon pot. It is quite beautiful in all stages,with it's shiny leaves. 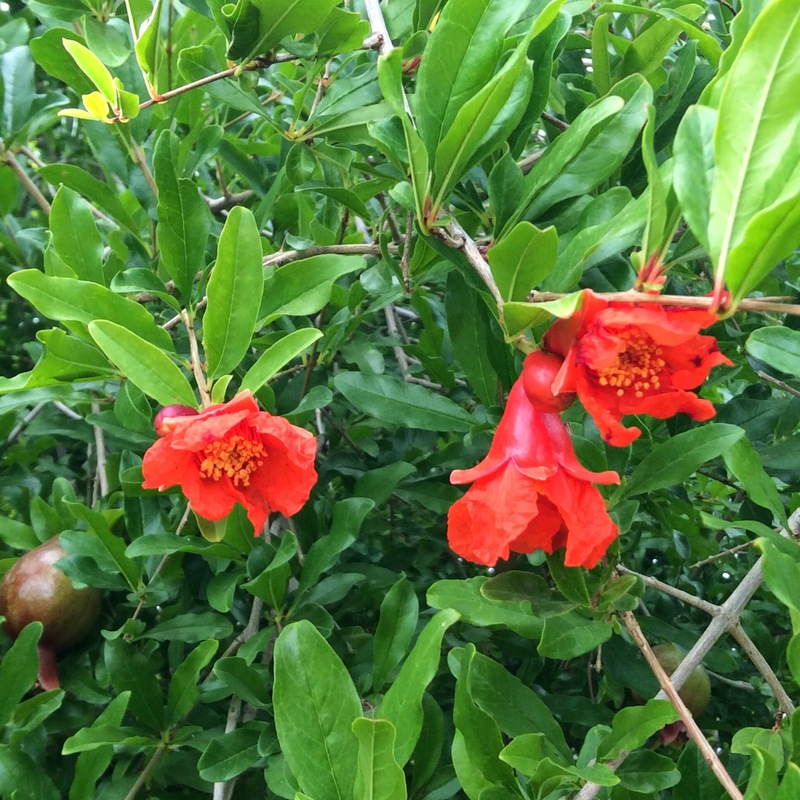 The hummingbirds are very fond of of the pretty orange flowers. This is what the new blossoms look like . . . This tree is literally abuzzzzz right now! 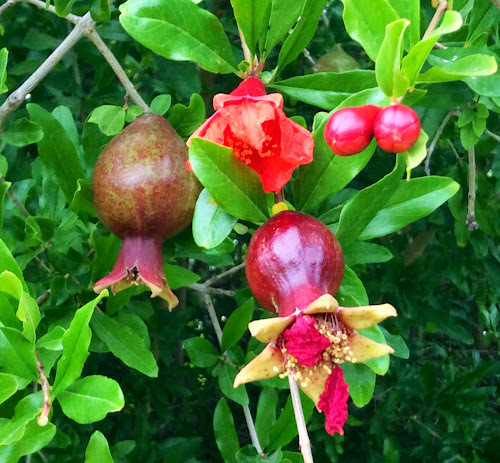 Here's a photo of the pomegranate in all 4 stages . . . Left- a baby pomegranate fruit, Center- a beautiful orange blossom, Right- tight buds, Bottom- a mature blossom. This Ein Shemer apple tree originated in Israel. 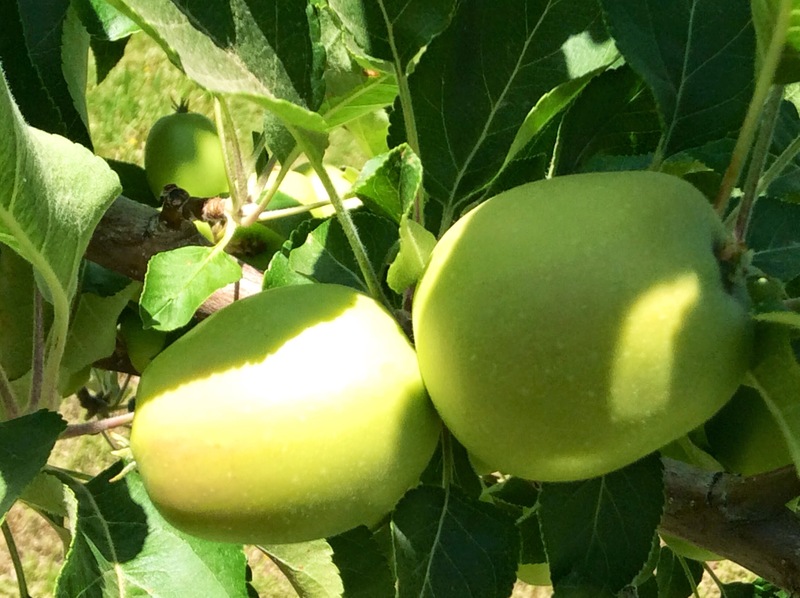 Our honey bees did such an outstanding job pollinating, I had to thin out the apples so the limbs don't break! 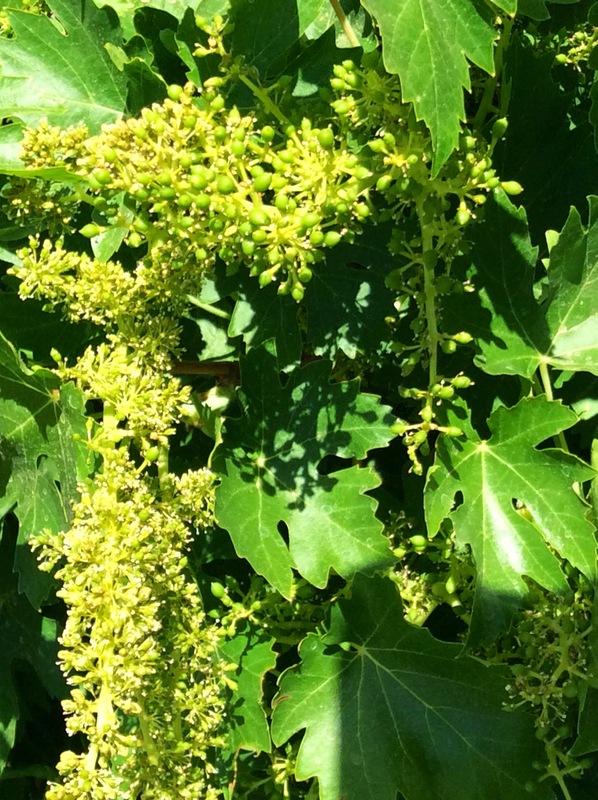 This our Thompson Seedless grape vine. This year we'll have a bumper crop . . . It's loaded! Soon I'll be covering the clusters with brown paper bags to keep the wild birds and our chickens from destroying our crop. Of course, we alway share with our Girls! It was a busy 15 minute photo shoot, but one of my favorite things to do . . . Admire and document the sheer beauty . . . Over at Julie's!!! 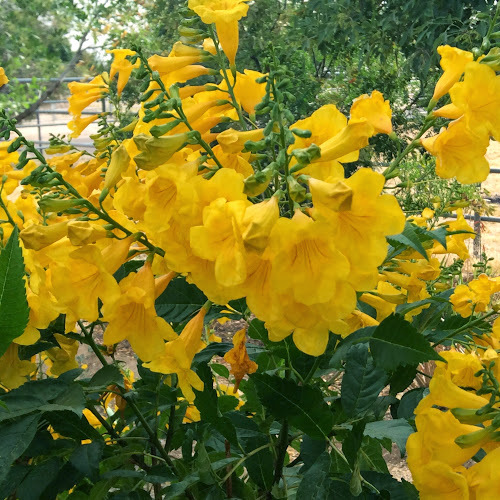 What are you growing in your backyard right now? I'd love to see some of your photos, or hear about what your are putting in this Spring or Winter, depending on where you life in this wonderful world! Please drop us a note.